Trump’s Security Team Aligns With Iran & Its Proxies: Following Putin’s Leash – Israel In The Cross-Hairs! How Did This Happen? What Are The Knock-On Effects? WHEREAS there is no need to rehash HUSSEIN Obama’s purposefully ignited Mid East wildfires, let it be stipulated: from the get-go, his intent was to empower Iran (via its proxy forces), Russia and Turkey through regional upheavals – starting with blowing Libya apart ala CIA sponsored weapons-running for the benefit of al-Qaeda offshoots and Brotherhood Mafia jihadis. In turn, said regional turbulence would “obligate” the U.S. to enter into an illegal war with Libya. For the record, some of us knew that it would be given “coverage” under the oft-ballyhooed “Responsibility To Protect” (aka R2P, an anti-American/western policy concocted by Samantha Powers, herself, a red/green ally) – hoisted within the umbrella of the biggest kleptocracy in the world, that is, the UN! WITH the above firmly implanted in mind, just follow the Machivellian strategic dots – laid out in May 2015 within an excerpt from “ISIS-Monster Fed By HUSSEIN Obama: Knock-On Effects To Illegal War In Libya.” The deliberate plan is revealed within. INTRINSICALLY, this anti-American strategy ensures that ISIS will catapult from strength to strength. Assuredly, they are unimpeded due to a dearth of U.S. hyper-power. Not only that, they are winning via a treasure trove of American weaponry lifted from the battlefield – with upwards of 52 155mm M198 howitzers back in 2014 – and enumerable more platforms since then! IS it not treasonous to abandon the epicenter of the west’s struggle to global hegemonic Islamic monsters? ALAS, the above treacherous calculus – played out to the max – will leave little regional recourse, other than to call in Iran’s direct “assistance” to battle ISIS! Wait and see. Mind you, the fact that Iran is already deeply involved in the battles raging in Syria and Iraq (others as well), has little to do with what comes next….continue reading…. INDEED, “HUSSEIN’s Mid East Designs Come Full Circle: Hands Reins Over To Russia, Iran & Turkey – Global Knock-On Effects” (Aug. 2016) foretold that which is currently unfolding – only a few miles from Israel’s northern (Golan) border! No doubt, what we are currently witnessing was designed to be a fait accompli. IN this regard, one would have expected (emphasis placed) President Trump to execute a swifter than swift reverse course, an immediate volte-face — despite his rhetoric to the contrary that Iran’s genocidal mullahs will be defanged by not re-certifying the ‘worst document’ he’s ever seen! EVEN so, although President Trump has his heart in the right (no pun intended) place, the fact of the matter is that it is not worth diddly squat when it comes to strategic decision-making. BUT before doing so, know this too: of late, yours truly spent several hours in urgent meetings with “ears to the ground” Israeli contacts, whose “business” is to keep a watchful eye (foot…toe…call it what you will) on the hottest fronts within Israel – and beyond its borders alike! Thus, when their “marching orders” in this direction, in effect, are to sound the highest alarm and alert, trust, this commentary analysis is not for nothing, nor plucked out of thin air. Mind you, their documented intel (incidentally, gleaned more than a week prior to the following report by DEBKA, Aug. 12, 2017) matches, almost to a tee, with this analysis. So, take it to the (strategic) bank. But that arrangement never stood up.Nearly four weeks later, on Wednesday night, Aug. 9, on the same night that Russian troops moved into Quneitra, the Syrian army and Hizballah launched a major offensive in Sweida province. Three days later, by Saturday, they had forced the local rebel forces to retreat into Jordan and seized 57km of Syria’s southern frontier with the Hashemite Kingdom. Two world powers are therefore backing the Syrian-Iranian-Hizballah lineup against the extremists. 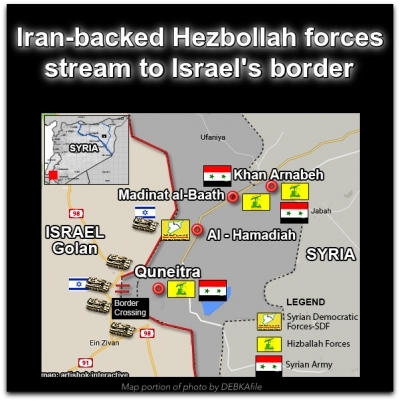 Iranian and the pro-Iranian Hizballah are being enabled to reach Israel’s borders – not as a result of the removal of ISIS but the open door provided them by the coordinated actions of two world powers. But what exactly can he do against the jeopardy to Israeli security resulting from the process underway in Syria, which is supported not just by Russia, but by Israel’s most stalwart strategic ally, the United States, and supportive Saudi Arabia? AND, just so that there is no misunderstanding, Trump’s Mid East “deal” with Putin shouldn’t be conflated with the so-called Russian kerfuffle – already, proven to be a fake news story implanted by the deep state. RATHER, it is a direct knock-on effect to President Trump’s appointment of those who are deeply aligned with HUSSEIN Obama’s Mid East chessboard. Resultant, his obdurate refusal to remove them from the highest security levers in Washington have ensured the same strategic outcome!! IN fact, much has been written at this site about this unfathomable state of foreign affairs, in so far that President Trump promised to reverse course from HUSSEIN’s anti-American Mid East policies. MORE specifically, “Trump’s Paradox: McMasters & Powell Sabotage Via Leaks, As ‘The Donald’ Talks Tough On Islamic Jihad. What’s Going on?” spelled it out: between McMasters at NSC, Mattis at Defense and Tillerson at State, each and every security appointee shields Allah’s Muslim Terrorists and is highly anti-Israel – which happens to be the only reliable ally in the fiery Mid East! Even more inexplicable, President Trump has yet to ensure that the Muslim Brotherhood Mafia is designated a terrorist org, per Congressional Bill S.68. LET’s put it this way: while President Trump, for the most part, is attempting to improve the domestic front – despite all the obstacles placed by the deep state – the opposite is the case in the Mid East. As to the real reasons why, well, only he knows the truth. But, at this end, let’s boil it down to his inability to declare – when it matters most: YOU’RE FIRED! MOST significantly, it is this unforgivable failure – to purge his wayward security heads – which brings an already fiery region to the brink of catastrophe; an arena which is known to have the most catastrophic knock-on effects on America! Indisputably, those who should have “taken care of business”, but failed to do so, brought about 9/11/01. It didn’t happen overnight, or come out of thin air. INEVITABLY, this go-around (with red-aligned Putin calling the shots – yes, he is – and in league with Iran’s genocidal mullahs), the notion that America won’t pay in spades is delusional. It is a foregone geo-strategic outcome. Conclusion.